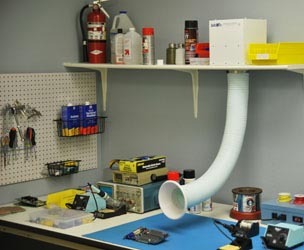 The Mounted Sentry fume extractor is a small but powerful industrial air cleaner that can be mounted directly to a workbench, a hood, or even to enclosed machinery. This modular unit provides multiple mounting options, two inlet configurations [3” or 4” diameter], and can be a simple and effective addition for multiple brands and types of enclosed machinery that require fume extraction. 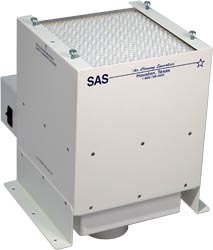 This unit is typically used for applications including: Laser Marking, Particulate Control, Printing Fumes, Soldering, Fume/Vapor Source Capture, and other applications that produce smoke, dust, or particulate. 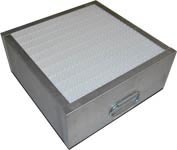 High-quality filter media for this unit is customized depending on the application being performed, but typically utilizes HEPA filters [up to 99.97% efficient on particles 0.3 microns and larger], ASHRAE filters [up to 95% efficient on particles 0.5 microns and larger], Activated Carbon, and specialty-blended filtration media [i.e. Acid Gas, Mercury, Aldehyde, Ammonia]. 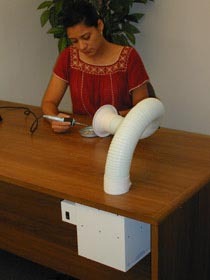 The Mounted Sentry provides a highly energy-efficient, quiet and economical solution to many fume extraction needs. 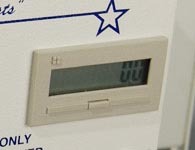 A larger model is also available [SS-300-MS].